No visit to Paris would be complete without dropping in on Lorenzo Cifonelli and seeing what weird and wonderful things his mind has inflicted on tailoring recently. First up was the yak jacket. I wrote about this back in February on The Rake, but I hadn’t seen it in person until now. Up close, you realise how ideal yak wool is for tailoring. Substantial and yet soft, it has a slight sponginess that recalls jersey cotton, but is more like cashmere in feel and has more substance than both. It is woven to order in Tibet, on old single-width looms. Such has been its popularity that Lorenzo now has a book with dozens of available colourways. I’m not sure the grass green is quite me, but a darker green or tobacco brown would be beautiful. The cut too is typical Lorenzo, the unnotched collar a subtle change that suits a countrified piece. The final, angled buttonhole is a nice touch and the sheer number of them shows off the Milanese finish that Cifonelli does so well. The other two pieces are more recent. First, a double-breasted jacket in a blue silk mix that uses separately cut pieces for the lapels in order to get an exaggerated curve. Being separate pieces, they can be cut on the bias of the cloth and so be worked into a broader sweep up the chest. That, combined with the bottom buttoning point, produces a larger opening to show off shirt and tie, and a rakish overall appearance. Last, a tweed double-breasted coat with broad, square lapels. The size of those lapels produces a high, sheltering collar when they are raised – accentuated by backing the collar itself in a thick suede that helps it ‘snap’. 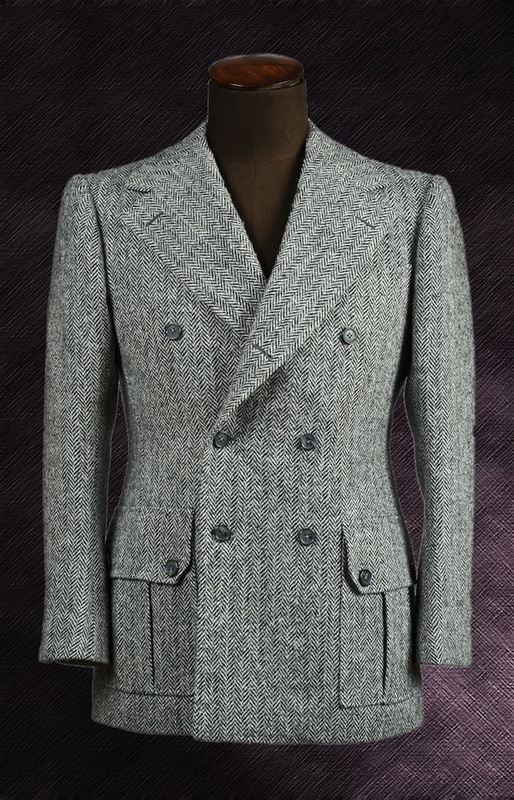 I also like the bellow pockets with a separate strip of cloth covering the pleat, and angled buttonholes on the flaps. These jackets won’t be for everyone. I personally wouldn’t wear any of them exactly as they are shown here. But each design provides some form of inspiration, and Lorenzo continues to be one of the few original minds in bespoke. 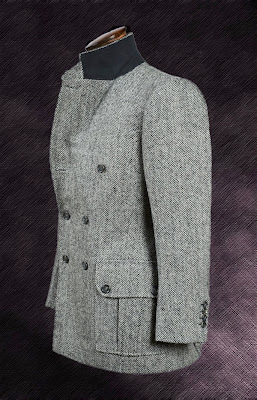 Readers can see examples of jackets I have had made at Cifonelli by using the search tool in the top left of the screen. You can follow the discussion on New Cifonelli jackets by entering your email address in the box below. You will then receive an email every time a new comment is added. These will also contain a link to a page where you can stop the alerts, and remove all of your related data from the site. Simon, what would be, roughly, the price range of a Cifonelli´s jacket? Very 1970s style. Roger Moore as James Bond. Probably not James, no. I wouldn’t advise taking off the lapel once the jacket is completed as it could ruin the shape. 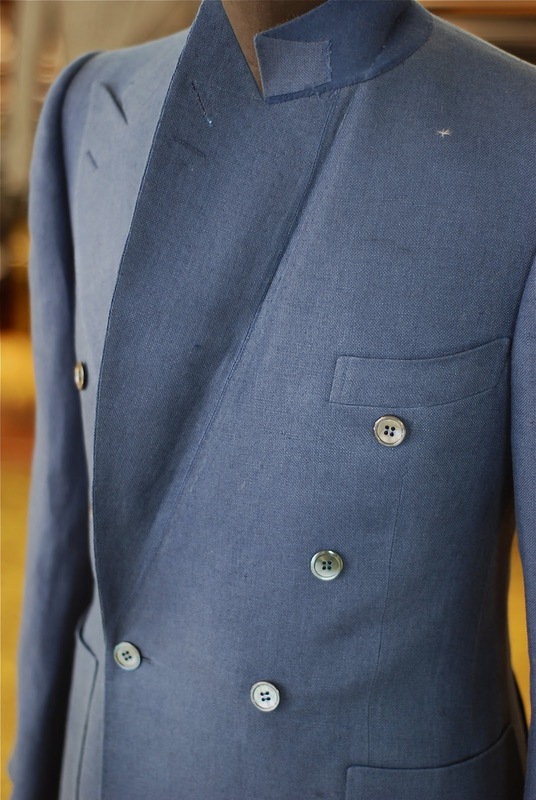 A tailor might be able to unpick the lapel itself, cut down and close it up again, but it could easily go very wrong. I wouldn’t recommend it. I am going to attempt to wear the italian style lapel with the style intended! You are indeed a national treasure but I’m afraid that you’re suffering from our brief heatwave in the Big Smoke, my good man! Lord Nelson would turn in his casket if he thought for a moment that our complicated little friends across the English channel were considered ‘serious’ tailors! The French favour style over substance in every fibre of their being. We love them for it! However, in proper clothing, the more fussy the details the more cheap it looks. One simply lets the cut, the cloth and the construction speak for themselves. Leave ‘design’ to the fashion designers! The garments above are a catalogue of bad basic tailoring. Dare I say it, but these garments are suffering from a ‘Napoleon Complex’! Damn it, there goes my Legion D’Honneur. Vive La France! E Sexton, C&M, D Taub,…. are these beloved British tailors not also dandy-ish? Why should design be abandoned to ready to wear? A Tom Ford suit is better cut than most Savile Row’s, and not to dissimilar to E Sexton by the way. Last, while not everyone can wear a Cifonelli coat, I find it hard not to salute their effort to infuse some creativity in tailoring. Was Nutter not creative and an influence to the above mentioned SR masters? But I bet your style is more H Poole and A&S (which is fine). I dare say that your inner dandy is getting the upper hand, my learned friend! The world would tend to disagree with you. The Savile Row tailors’ order books prove it. All the same, good luck to Cifonelli in all their dandyish endeavours. Second, many of the French bespoke stars (e.g. Cifonelli, Smalto, De Luca, Di Fiore) trace their roots and tailoring chops back to Italy — sometimes even the same village, as is the case with De Luca and Di Fiore whose familes hail from the same village in Italy. I don’t think anyone reading this would challenge the credibility of fine Italian tailoring the way they might do so for French tailoring. Therefore, I must conclude that the remarks of the previous poster are simply another instance of gratuitous French-bashing. Third, don’t let the Cifonelli examples shown above lure you into believing that they characterize French bespoke tailoring, nothing could be further from the truth: Cifonelli’s prototypes, while interesting in their own right, are also completely out there on a planet of their own — they don’t really belong to any other bespoke tailoring tradition that one can easily point to. Fourth, I’ve heard it said that the French tailoring tradition offers a just compromise between the UK and Italian traditions — which would make sense geographically-speaking. 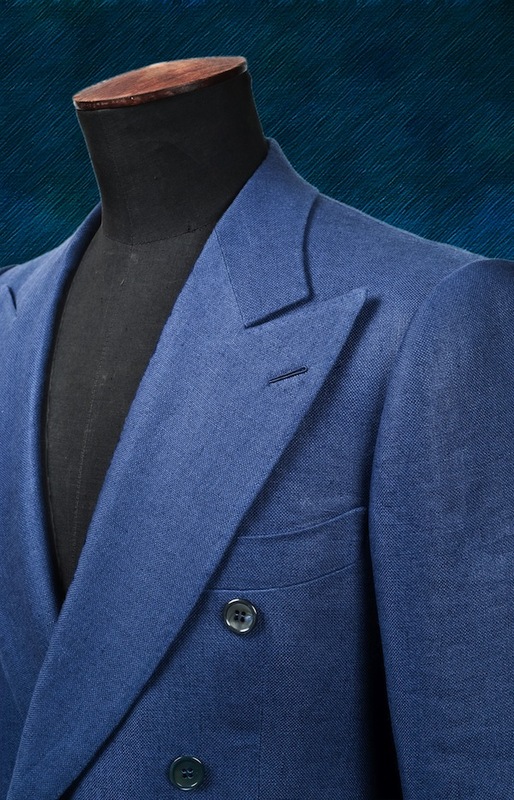 From experience, that’s a fair description, as French tailoring embraces the formalism of the Savile Row tradition while also drawing on elements of softer italian tailoring. An illustration of this perfect balance is Camps de Luca — which, in passing, rarely receives from tailoring enthusiasts the kind of attention it deserves. And this brings me to my last point: there is alot of value in French tailoring, but France is better known for womenswear and luxury goods, and the men’s bespoke tailors haven’t been very savvy when it comes to promoting themselves on the global stage. 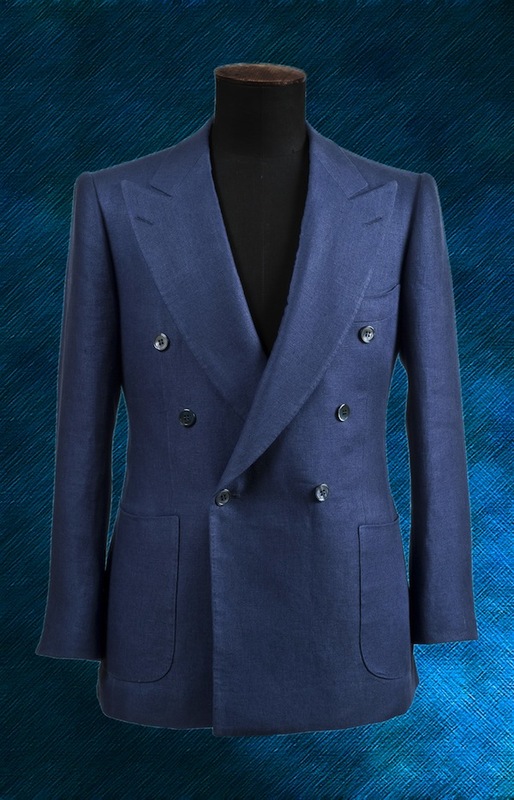 Discerning clients know better: a Di Fiore bespoke suits starts at 2500 euros — now you can’t beat that in terms of value-for-money ! So I, for one, as an american tailoring geek living in Paris, am quite glad that some potential clients are totally missing the picture when it comes to the French bespoke houses. Thanks, I echo those thoughts. My only addition would be that Camps has got a lot of press through dressing Wei at The Rake, and of course the common roots stretch to Smalto and Cifo’s master tailor working together originally at Camps. I’ll try to delay writing about De Fiore! Strictly speaking, one does not go to a tailoring company, rather a cutter within that company. There are good and bad within every firm. Mr Colin Hammick looked after me for many years at Huntsman. When he died another cutter was recommended to me by a friend. One does not change tailors willy-nilly. One hates to be pernickety but why is the outbreast welt pocket on the blue double-breasted number nearly under the arm? Lacks judgement. Also, there is a very good reason that a DB garment does not normally have all 3 rows of buttons ABOVE the waist – it looks rather awful! The buttons are nearly under one’s chin. One hates to raise these points publicly but when the dear Mr Compton states with journalistic certainty that the French tailors outstrip the Row I do think someone should redress the balance! Before ‘Dirnelli’ raises the point of Cifonelli lacking publicity, remember that Savile Row has been a mecca for men of style and influence for 200 years, has invented most things we wear today and has gained a worldwide reputation….without advertising. Italian tailors, I’m reliably informed by people who know, are either very good or very bad. 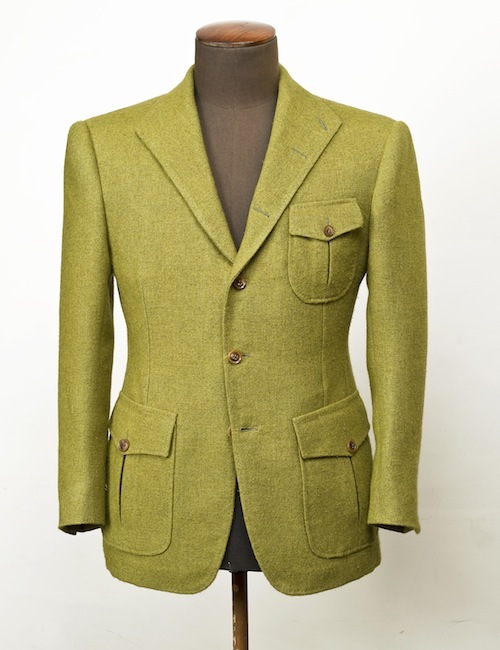 The Italians adore English style and copy it with characteristic flair and panache. They tend to cut a boxy jacket. Usually well-made, but not for everyone. I do wish that the Brits would stop assuming that everything French and Italian is best! Rule bloody Britannia! I’m not sure I said many of the things you accuse me of. I would also kindly suggest having clothes made by tailors from Paris, Milan and Naples before passing judgment on any of them. to “A Man from Mayfair”: you should indeed try both Italian and French before judging rather than being “reliably informed”. I have bespoke from Rome, Paris and London in my wardrobe and in no way I could say with certainty that Savile Row is far ahead. From Savile Row, my experience is limited to Anderson & Sheppard and Gieves & Hawkes. The first was a great experience and the second a very bad one. The construction is well made but when it comes to details, my Savile Row pieces are far far far from the quality of the French and Italian tailors. The inner lining is not hand stitched, the pockets are very simple and the Buttonhole (Milanese, Asola Lucinda, as you wish) is not outstanding, to say the least. Now, in Paris, I’ve tried Camps de Luca and Cifonelli. Both have their advantages and Cifonelli, while trying to make something totally new, did not really convince me. Camps, on the other hand, is one of the only tailors that I met that truly impressed me and that I totally respect. Marc de Luca is a gentleman and though they do have good press from The Rake, they don’t advertise that much. As for Rome, it’s true that Italians tend to copy the English style but they add a sense of color that the English lack, whether we/you like it or not. All in all, there are tailors for everyone here. I don’t think that one could say that one country has the supremacy, rather than each customer has his own favorite tailor, and that’s all that matters. The best thing about having coats it that you can be protected from colds. I love those what you got there by the way. They are so formal. Perfect for my job. What a wonderful post ! And of course… jackets ! I didn’t saw these new models during my last visit in the workshop in Paris but what I can say is if I tried many tailors in GB, italy and france, Cifonelli is trully the best !